The 24-year-old striker scored a personal best 41 goals this season and had been mentioned as a possible target for European champions Real Madrid with other clubs also lurking in the wings. 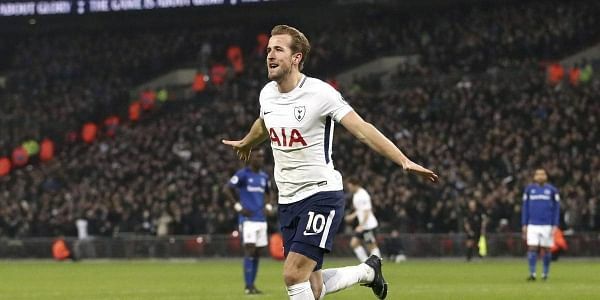 LONDON: England captain Harry Kane gave a huge boost to Tottenham Hotspur on Friday by signing a new six year contract through to 2024 with the Premier League club. Some had speculated Kane would want a move away so he could win some silverware as despite Spurs manager Mauricio Pochettino gaining plaudits for the attractive style of football they play they are yet to win a trophy under him since he took over in 2014. "We are delighted to announce that Harry Kane has signed a new six-year contract with the Club, which will run until 2024," read a statement from Spurs on their website. Kane -- who may have been inspired to commit himself after Pochettino signed a five year contract in late May -- said it was exciting times for the players at the club as apart from seeking a title they are also looking forward to moving into their new state of the art stadium having had to paly their home matches at Wembley last season. "I'm really excited, it's a proud day," Kane told the club website. "Obviously it's been a great few seasons and I'm looking forward to the future. "I'm looking forward to the new stadium first and foremost and just to keep progressing as a Club. "It's been fantastic to consistently get in the Champions League so I'm really excited to have another go at that. "For us as a Club, it's just about keeping improving and we'll work hard to do that." The settling of Kane's long-term future will also be pleasing for England manager Gareth Southgate as it will not serve as a distraction during the World Cup finals this month. "I'm obviously really excited about the World Cup coming up so it's nice to get this done before that and I'm just looking to go out there and enjoy it now," said Kane. Kane -- who will be seeking in Russia to make up for a disappointing Euro 2016 campaign -- has established all kinds of landmarks since breaking into the Spurs first team four seasons ago. He became the Club's leading scorer in the Premier League era, surpassing Teddy Sheringham's total of 97, while he has also joined the elite group of players to score 100 Premier League goals, doing so in just 141 games. Kane finished the 2017 calendar year as the top goalscorer in European football with 56 goals for Club and country, as well as breaking Alan Shearer's record for the most Premier League goals scored in a calendar year, recording 39 in total.